Home / News / Latest News / Why Choose Target Blu Eye For Your Vehicle? Target Blu Eye is a piece of equipment that has become more popular in the UK over the last few years and has received coverage from multiple industry publications. It’s marketed as a device that allows you to detect nearby emergency vehicles, both marked and unmarked so that you can ensure you’re able to drive accordingly by moving out of the way of emergency vehicles that are on active jobs. But what actually is the Target Blu Eye and how does it work? How Does Target Blu Eye Work? Target Blu Eye works by detecting TETRA radio signals. TETRA systems are widely used in Europe by emergency services and government officials due to their ability to transmit to multiple devices. As opposed to one-to-one walkie talkie systems, TETRA devices allow you to communicate one-to-many, which is why they suit emergency services. 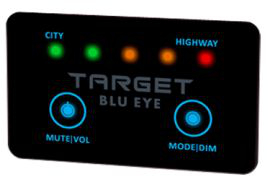 The way that Target Blu Eye works is by detecting TETRA signals and displaying the presence of a TETRA device nearby, indicating that an emergency service vehicle is in the vicinity. Target Blu Eye works at a radius of up to 1 kilometre. The system has multiple sensitivity levels, allowing you to detect emergency vehicles at a larger radius on motorways, where distances can be closed faster and on a smaller radius in towns and cities. Providing both visual and audible warnings, this device can also detect unmarked emergency vehicles. The signal will be activated and the signal strength meter in your vehicle will give you warning allowing you time to alter your driving and ensuring you are able to drive safely. Our team are able to complete the professional and discreet installation of your Target Blu Eye system. If you are interested in adding Target Blu Eye to your vehicle, you can fill out our online contact form or call our friendly team today on 01234 342 300.